Strong school libraries build strong students and lifelong learners. Now is the time for students to start thinking and designing their posters. Consider drawing a few "thumbnail" sketches before you begin your poster. 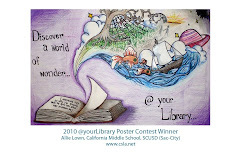 Read the about page, poster contest rules and entry form for this year. LIBRARY STORE - illustrators galore!